The winner of the Garden to Glass cocktail competition is selected by the attendees, who sample each cocktail during the reception and cast their vote. Garden to Glass is followed by the Farm to Table dinner on Thursday, Aug. 16, with proceeds going toward Eagle Valley Land Trust's mission to protect public lands. What: Farm to Table, a fundraiser for Eagle Valley Land Trust including a Garden to Glass cocktail reception. Where: Property in Lake Creek Valley. When: Thursday, Aug. 16, Garden to Glass from 5 to 7 p.m.; Farm to Table dinner to follow. Cost: $275, with table packages also available; $50 just for Garden to Glass cocktail reception. More information: Tickets and tables are available by calling 97-0748-7654 or visiting evlt.org/f2f. EDWARDS — Farm to Fork is the largest annual fundraiser for the Eagle Valley Land Trust and local land conservation efforts. 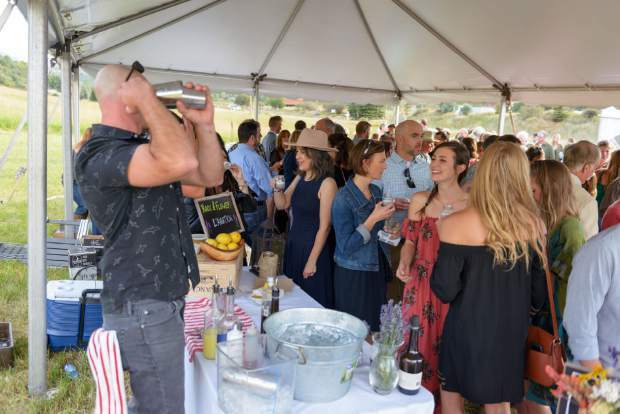 This year, Farm to Fork and Garden to Glass return Thursday, Aug. 16, at an exclusive property in the Lake Creek Valley. The evening includes a three-course dinner prepared by local chef Eric Berg for the second year in a row, featuring locally sourced, seasonal food as well as dancing and live music by local band Rewind. Tickets for Farm to Fork are $275 and include the Garden to Glass cocktail reception. Table packages are also available. Tickets for the Garden to Glass cocktail reception only are $50. For more information and to purchase tickets or tables, call 970-748-7654 or visit EVLT.org/F2F. New in 2017 and returning this year by popular demand, Garden to Glass is an exciting cocktail reception from 5 to 7 p.m. featuring a cocktail competition that challenges local bartenders to create their most sensational beverage highlighting a single secret ingredient. This year’s competitors will include 10th Mountain Whiskey and Spirit Co.; Root & Flower; The Rose; Terra Bistro; Pivot 62; and Vail Catering Concepts — competing for the traveling trophy, cash prize and a year’s worth of bragging rights. Proceeds from Farm to Fork and Garden to Glass support the Eagle Valley Land Trust, whose mission is to protect local open spaces, scenic vistas, historic lands, waterways and wildlife habitats in Eagle County.